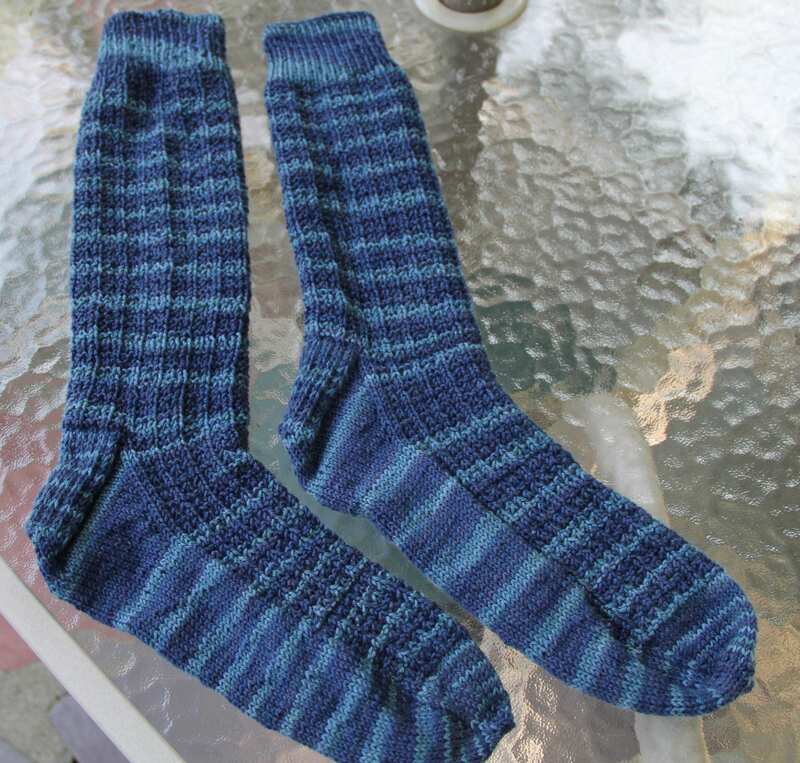 The Skipper’s sock, though unblocked in this picture, are done. As a former literature major, working socks from the cuff down, is like fine ancient Greek Tragedy. First the ship sails out from the shore and it’s all high expectation, acknowledging the pitfalls and vowing to avoid them this time around. So begins the cuff of the sock which is a one by one ribbing. Then comes the endless days at sea. No land in sight, every day the baking sun followed by endless night. High expectation wears thin and it feels like I will never get beyond the leg of the sock. Add to this a number of rip backs because I somehow got off pattern and it can feel like sailing the same bit of water over and over again. Suddenly Scylla and Charybdis loom up on either side and though I vow not to get shipwrecked again only a fool would believe it, Hence I try to thread the rocks on either side without ripping out my keel as I navigate the heel flap, heel turning and picking up gusset stitches. With four dpns filled with stitches I begin the arduous task of decreasing every other row either side of the foot to return to my cast on number. This is Circe. On the surface everything is alright, I can do this, nothing to worry about, but below deck everything is turning into a swine trough. A missed decrease here, another there, and the foot of the sock begins to look a bit wonky. After a number of rip backs I can almost understand Medea’s level of anger. Then comes the blessed toe. The seas are calm, the winds are fair and there’s a big rock island straight ahead that I can’t see because of some weird effect that shrouds it and bam! I’ve hit it dead on. Four stitches needed to be decreased each side not two. Rip, rip, rip. Finally, I am done with all the decreases and am evenly dividing the sock to be Kitchener Stitched closed when I see I have one extra stitch, throwing off the even division. What difference, I reason, can one little stitch make? I see the dock from the deck of the ship. Do I want to take her back out and sail around a little more or do I want to bring this baby in and land her? Okay, so one stitch does make a difference. But I think I hid it well. 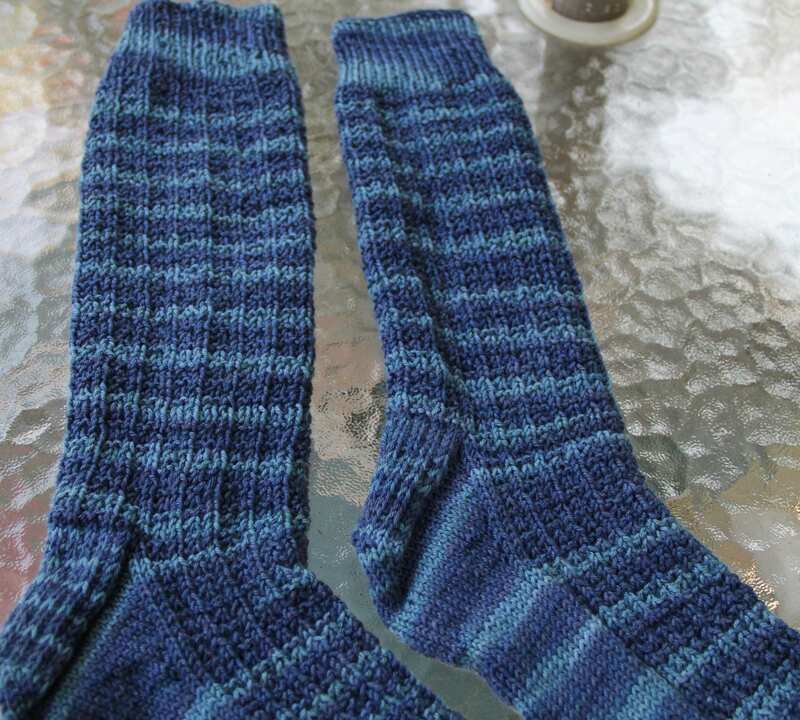 The sock pattern is from Anne Hanson Gridiron. The sock yarn is Lorna’s Laces Shepherd Sock Sheridan colorway. they look great, extra stitch or not.